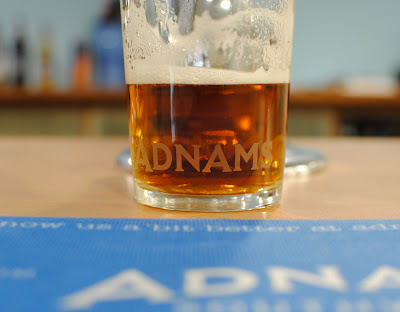 I was lucky enough to go on the Adnams brewery tour a few weeks ago here in the UK. Adnams make some of my favourite bitters. A drink that I'm happy to be reacquainted after a long dry spell in Oz. Australia has some great beers (including those made by members of the DTWC), but one thing Aussie don't seem to make, is a decent English style bitter. Red Oak had the only English bitter that I was able to find in Sydney and being served at only one pub limited my ability to enjoy a glass all that often. The Admans brewery is located in the heart of the small village of Southwold. The layout is incredible with modern stills squeezed into old buildings. Pipes run under the road between fermentation tanks and the kegs are filled behind what looks like a row of terraced houses. As part of the tour we got to taste the different malted grains that they use and smell all of the hop varieties. There was a lot more differentiation than I was expecting between the hops, with each having a very distinctive nose. A few years ago Adnams introduced some small copper stills at the brewery to start making spirits. They are currently selling gin, vodka, absinthe and 'The Spirit of Broadside'. Distiller John McCarthy has also created a whisky which is due to go on sale early next year. Unfortunately there were no tastings of the whisky on offer during the tour. I asked our guide if they were following a similar strategy to Grant's Ale Cask of maturing the whisky in beer barrels. I was surprised to hear that Adnams aren't going to be following the same strategy. Being a fan of the Ale Cask I can't help but think they've missed a great opportunity. 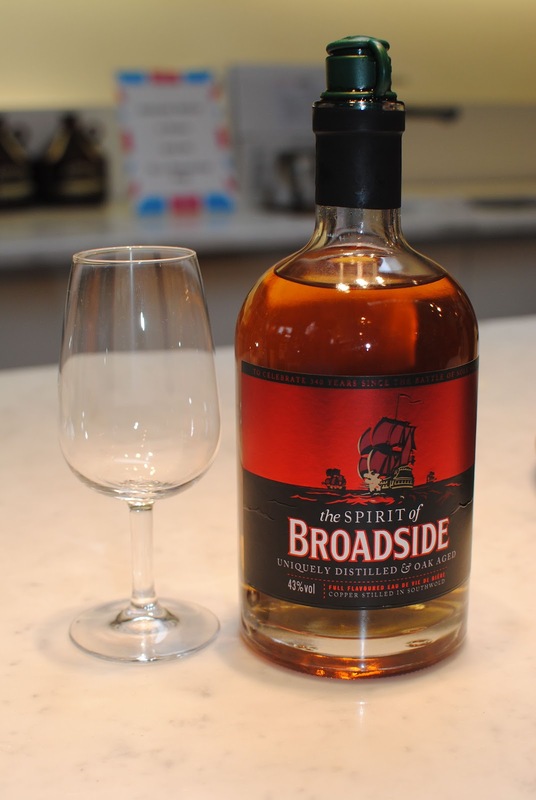 The 'Spirit of Broadside' offers a preview of what their whisky will be like as they advertise that it "is distilled in a similar manner to our whisky" and matured in the same "heavily toasted Russian oak casks". It had never occurred to me to distill beer into whisky, but apparently bierbrand or Eau de vie de bier is a tradition of doing just that in small breweries and monasteries across Europe. Adnams are distilling their most popular beer 'Broadside' to make whisky. How does 'The Spirit of Broadside' taste? Colour: The colour is quite dark for a one year old spirit. I haven't been able to find out if any caramel has been added. Could that be a natural colour after just one year in oak? Nose: Christmas cake, lots of Christmas cake. Fruity, spicy and rich aromas. Palate: The Christmas cake continues to come through on the palate. There is an initial spice from the oak and then the flavour develops with more of the fruit coming through. Overall it was an enjoyable spirit and has certainly piqued my interest to try their whisky when it is available.